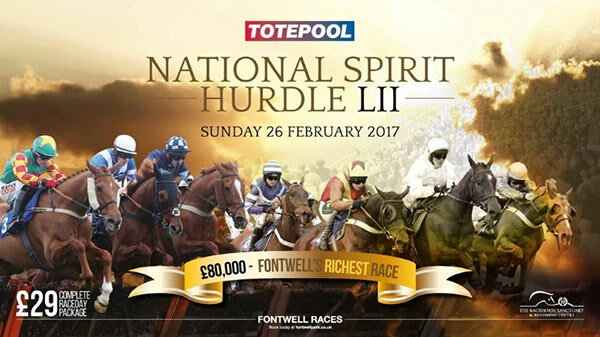 WIN Tickets to The Racehorse Sanctuary National Spirit Hurdle Charity Raceday at Fontwell. The Trustees of The Racehorse Sanctuary, registered charity no 1117361, are pleased to announce that the move of the Sanctuary and our horses to Brewham Lodge near Bruton in rural Somerset has been successfully completed. 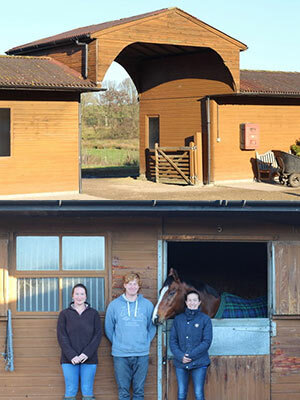 All the horses are settling down in their new home, where our facilities include: sixteen stables, indoor and outdoor schools, a round pen, lots of good hacking, two cottages and 40 acres of grazing. Our team at Brewham Lodge is led by experienced Yard Manager Ruth, who has worked with us before and has moved from West Sussex with her family. Ruth is supported by Jemma, who has moved from Surrey to continue working with us, and locally recruited Edward, who completes the current team, helped by Ruth’s daughter Abigail. Whilst Ruth concentrates on running the Brewham operation, Founder Graham Oldfield will focus on his role as Welfare Officer, particularly advising on the care of our more vulnerable horses, recruiting new life-time keepers, and building our network of foster carers. With the move to Brewham Lodge completed and Ruth and her team taking day-to-day responsibility for most of the horses in our direct care, Graham and Sue have been working themselves into their new roles. Graham is focusing on driving the welfare policy of the charity, building our fostering networks and seeking to identify lifetime homes for those animals ready for new careers. Meanwhile, Sue has had her hands full caring for the horses she and Graham felt would not cope with the long journey to Somerset and those in need of a level of monitoring, with which Ruth would have struggled whilst settling in all of the other horses at Brewham Lodge. All Sue’s charges seem to have coped remarkably well, although Val at the age of 27 years has had to rely even more on 17-yo Sweet Pea to be her vision, hence they are stuck together like glue. Zigaura at 29 years old simply refuses to allow a simple change of scenery to alter her routine and ploughs on regardless, woe betide anyone who dares argue with her as she does not tolerate any other points of view. All dropped some weight, even relocating locally to a new home Sue had organised for them with her own horses, but thankfully all are gradually getting back to their happy, healthy ways, even Val. Unexpectedly, Emeebee or "B" as the team call him has had to be returned to the centre through no fault of his own. This super looking 11-y-o is a real character, very sound and well and an absolute pleasure to have around. Sadly he can no longer be ridden due to slipping a tendon on his hock in his racing days; the veterinary advice is that this old injury would not trouble him in the role of a companion, it probably would under saddle, so for his sake the decision was made not to put him at risk. "B" needs someone to love and care for him in the stable by night and in the paddock by day in the winter and vice versa in the summer. In return he will get himself as muddy as he can, insist on throwing the grooming kit around the stable whilst you groom him and kick up a stink if he does not get his food on time, but most important of all he will love you to bits in return. 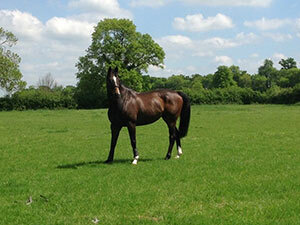 STOP PRESS: Great news, Graham has found someone to love “B” and he has moved to a new home near Blanford in Dorset. For more detail and pictures of his departure from Brewham Lodge, please see the posting on our Facebook page. 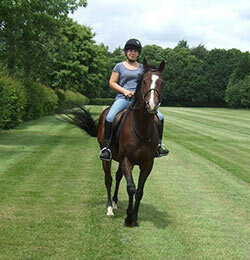 You all will have read about Mac the Knife’s super new home with Stacey in Oxfordshire reported in a previous issue. Good old Mac settled in really well in his new environment and was having a great time exploring the new paddocks and chilling out for a couple of weeks before Stacey started hacking him out through the local village and surrounding woodland area. Sadly whilst playing around with his new-found mate in the paddock, Mac slipped up, fell and sadly suffered a fractured hind leg which meant the vet had no choice but to put him to sleep immediately. Over the years Mac had given so much joy and pleasure to so many people, other than to be cared for he never asked for anything in return. This was a very special horse who may not have been a star on the racecourse, but he certainly was a star to all those who were lucky enough to have met him or dealt with him in any respect. Uncomplicated and never a problem in any respect Mac could be classed as a little insignificant but in our eyes and those who worked with him it was such a pleasure, in fact some would class it as an honour to be allowed to do so. Mac will be sadly missed by us all and none more so than his best buddy The Betchworth Kid (BK) who used to play with him by day and exchange gossip and stories with him by night. RIP dear Mac, we will never forget our times together. We know that some of our supporters love thoroughbreds but are not fans of horseracing, and their views have to be respected. However, no one can remain unmoved by the courage and commitment of a supreme athlete, exemplified by 2015 Grand National winner Many Clouds, as he beat upstart Thistlecrack in the Cotswolds Chase, before suffering a fatal internal injury – our hearts go out to the horse’s connections. A consequence of this tragic loss and in memory of Many Clouds a number of his admirers have chosen to make donations to the work of The Racehorse Sanctuary through our JustGiving page. In response Wavertree Warrior has, on behalf of all the equine denizens of Brewham Lodge sent these generous donors a Jacquie Lawson thank you card – click to see this card. Concerns about JustGiving after Daily Mail’s article about their fees. We do pay fees for the services provided by JustGiving, which help us keep our own admin costs down. For example JustGiving collect the Gift Aid due to us, send it direct to our bank and provide complete records of all donations. You can see the response from JustGiving to the Daily Mail by clicking here. 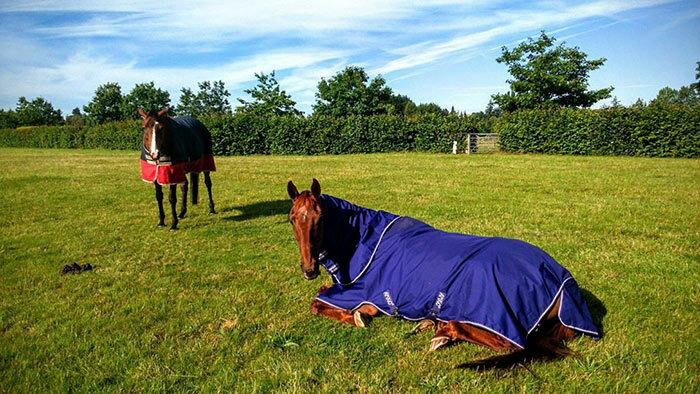 And on a less sombre note, Horse & Hound have published some heart-warming stories of retrained racehorse transformations; click here to enjoy these at your leisure.